Home › FAQ › What is an Alumni Scholarship? Paying for college may seem out of reach for some, but many change their minds after seeing the type of scholarships they qualify for at their colleges such as an alumni scholarship. An alumni is someone who attended that college in the past and most likely graduated from that school. Some schools offer scholarships created by those who attended the school before becoming famous and those who earned honorary degrees for the work they did. These programs give free money to students, but most programs require that students apply for those funds. There are two ways to find out about scholarships available through a school. The first is with the completion and submission of the Free Application for Student Financial Aid. Better known as the FAFSA, most colleges require that students complete this form when applying for admission. The government looks at a student’s answers and decides on how much financial aid that student should receive before sending a copy to the colleges the student chose. The college will then determine if a student may qualify for any scholarships and send information regarding those programs to the student. Students interested in a specific alumni scholarship can also contact the school directly and ask about application requirements and the scholarship deadline. Every scholarship that a student applies for comes with different requirements. Sabah Karmimi of U.S. News and World Report recommends that students read the details and requirements carefully and keep detailed records and copies of all application forms. If the school loses any necessary information, students can quickly send in a replacement. The requirements for each type of scholarship vary, but most programs ask for a resume and many require that students answer an essay question, complete a project and/or send in multiple letters of recommendation. There are dozens of scholarships out there for all types of students. They can apply for scholarships designed specifically for left handed people, those of a certain background or cultural heritage and even female golfers. An alumni scholarship is different. It is only available to students who attend that school. Many programs have additional requirements as well. For example, a scholarship may only be open to female students, those studying the same topic the former student studied or those who come from a certain part of the country. Alumni can add any requirements they want to their scholarship programs. A common question that many students have is how much money a scholarship is worth. The truth is that it depends on the program itself. Some scholarships may award students a few hundred dollars or just enough to pay for textbooks, while other programs pay the full cost of tuition. 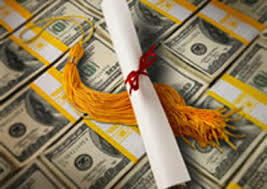 Some scholarships are also renewable, which means that a student can apply again the following year, and others automatically renew as long as students maintain a certain grade point average and meet any other requirements of the scholarship. College can range in price from $10,000 to more than $30,000 a year, which may not include room, board and textbooks. Students can use scholarships as a way to pay for their supplies and their tuition. In addition to unusual scholarships, students may also have the option of applying for and winning an alumni scholarship.